BROKEN NATION: Battles at home and abroad. 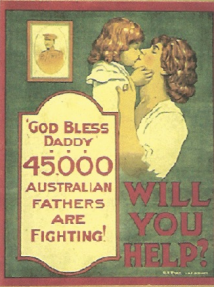 The Great War is, for many Australians, the event that defined our nation. The larrikin diggers, trench warfare and the landing at Gallipoli have become the stuff of the Anzac ‘legend’. But it was also a war fought by the families at home. Professor Beaumont will examine the effect of the war on the Australian people. Their resilience in the face of hardship, their stoic acceptance of enormous casualty lists and a belief in the justice of their cause made the war effort possible.